A bag that will develop all the character you could ever hope for, our new natural handmade messenger options are finally becoming available. Our new Natural Veg-tan / Full-grain Leather Bag. For a little context, about six months ago, we decided to standardize the leather we were sourcing, and consolidate the suppliers we were working with. Ideally, we no longer wanted to source our materials from multiple suppliers and resellers, as this was becoming a full-time headache. Worse, it was commonplace to receive subpar shipments, and making returns was always a devastating task. In any event, this wasn’t a difficult decision to make, but it meant reshooting all of our bags with our new leather — this is a process that is still ongoing, but on the upside, we plan to eventually shoot every permutation of every bag. 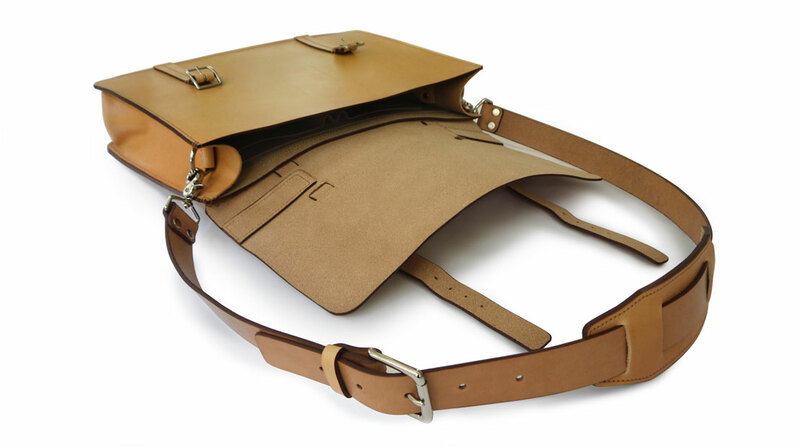 Back to this “natural” un-dyed bag, it is a leather type that we are now offering on all of our main bag models. Typically reserved for the leather connoisseur, it is a material that will slowly develop a beautiful patina overtime (the type of bag you hand down for generations), and we could not be more excited about sharing the new images. As always if you have any questions, please let us know, and see here for the first “natural” messenger bag listing.